Ombre is basically a hip word for perfect gradient and perfect shading from one color to another color. Ombre and gradient decor is very popular today: you may see it in homes, at various events and parties, and if you wanna add a trendy touch to your home decor this fall, I strongly recommend to make some ombre pumpkins. Here are some tutorials suitable for fall and Halloween, get inspired and go craft some! These colorful cuties are Blendo pumpkins inspired by glass ware from the 50’s and 60’s. they look super bold and modern and making them won’t take much time or effort – spray paints make it easier. As an optional touch, you can use a little gold craft paint to paint the stems for that extra shine! 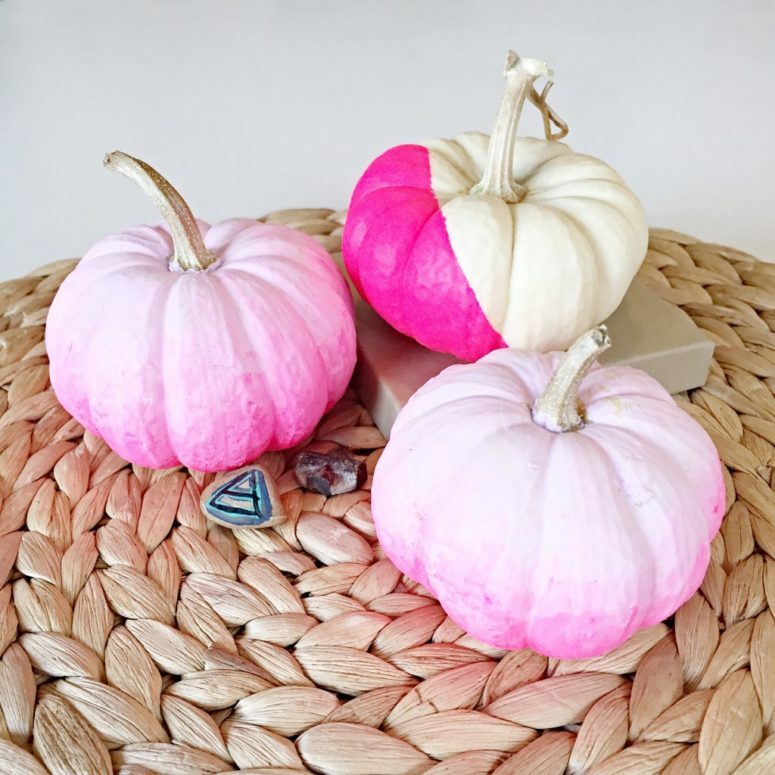 These amazing pink pumpkins are inspired by Breast Cancer Awareness, that’s why such a color was chosen. 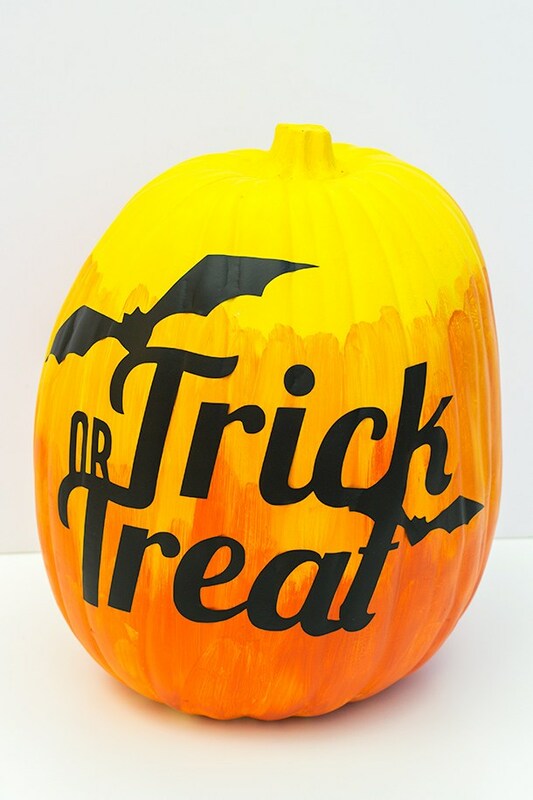 The ombre effect here is created not just on 1 pumpkin but within a whole range of them. As you can see, the pumpkins are sporting Martha Stewart Acrylic Paint and iridescent glitter. So cool and so bright! Looking for a Halloween or fall decoration that’s less messy than scooping piles of innards? If the palette of fall’s oranges and browns just isn’t your style. 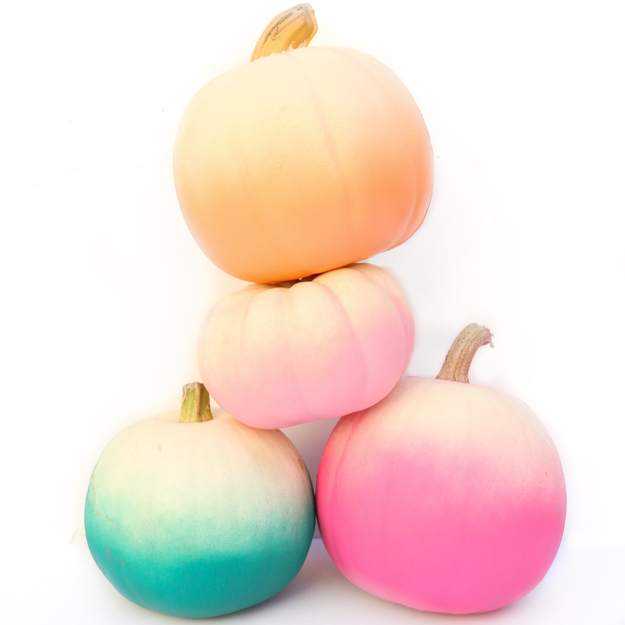 Make some super hip ombre pumpkins, that’s easier than you think! You just need 2 paint colors, 2 brushes, and a pumpkin or gourd of your choice. So you will want to pick two colors that work together. You could try a sea punk blue to purple, a refined silver to white, or peacock blue to white. Surprise everyone with bold color combos and enjoy colors this fall! To make your ombre pumpkins even more interesting, you may also use some stickers. This tutorial will tell you how to pull off ombre and vinyl stickers at the same time. The result is a bold pumpkin with festive text, perfect for Halloween or any other celebration depending on the text you prefer. The author used a Silhouette to cut out the black adhesive vinyl, but you may go for ready stickers as well. Happy crafting! 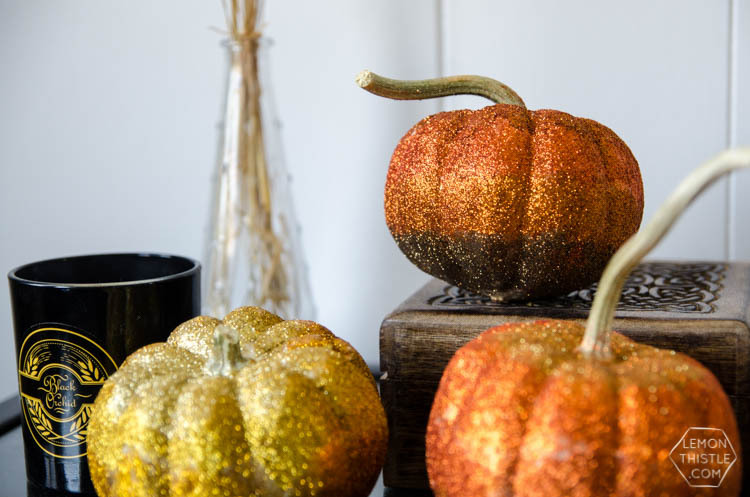 These ombre glittered mini pumpkins are worth crafting for sure! I love the sparkle they can bring to usual Halloween decorations. These little guys are totally inexpensive, though they don’t look cheap. Before you get started, clean your mini pumpkins with soapy water. This will help keep them from rotting. When you pick your mini pumpkins, keep in mind you’ll only see the stems and not the bruises on the pumpkins so go for awesome stems instead of perfect pumpkins. Watch the video tutorial and continue crating! Sure, traditional fall colors can be beautiful but sometimes it’s nice to add a pop of warm-toned brights to this conventionally dull-hued season. 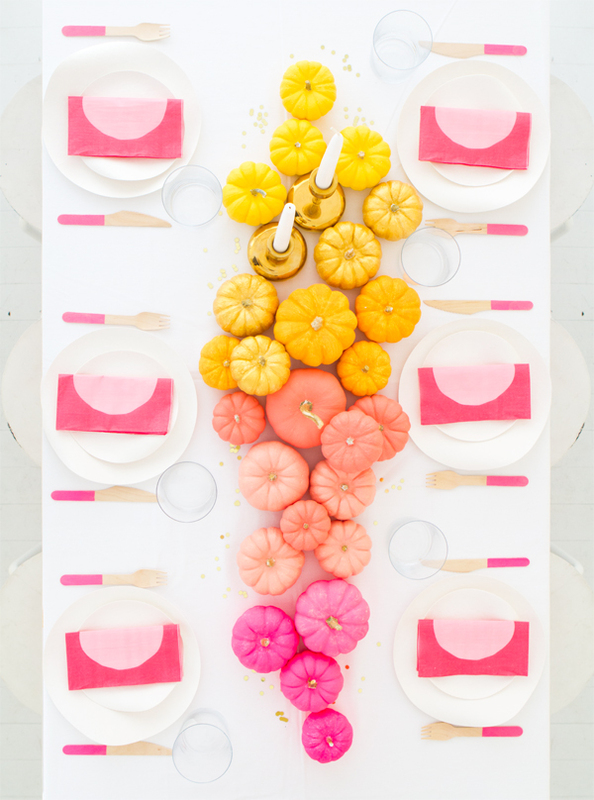 Try making this cheerful ombre centerpiece for your fall parties: just gather some mini pumpkins and paint in a spectrum ranging from bright yellow to neon pink! Be sure to include touches of gold for some added sparkle! 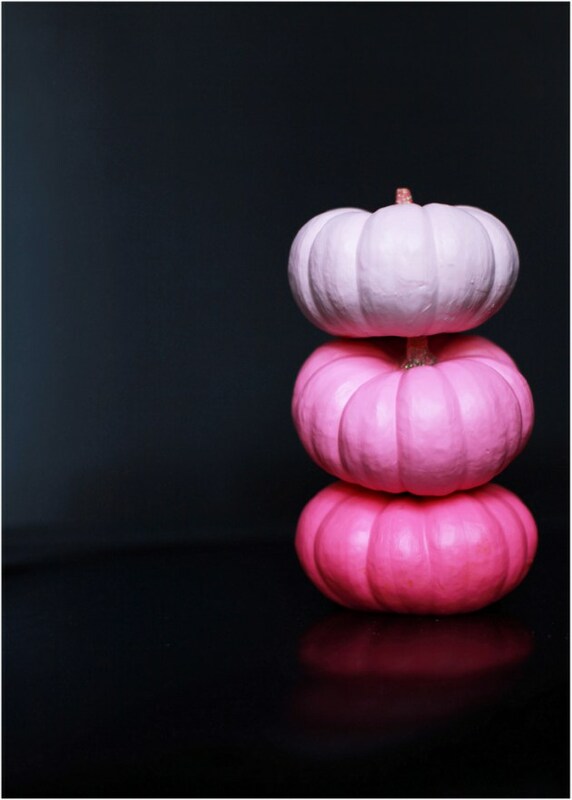 Halloween isn’t just about ghosts and goblins, bring a little bit of whimsy with your pumpkins this year: go for colorful ombre pumpkins. 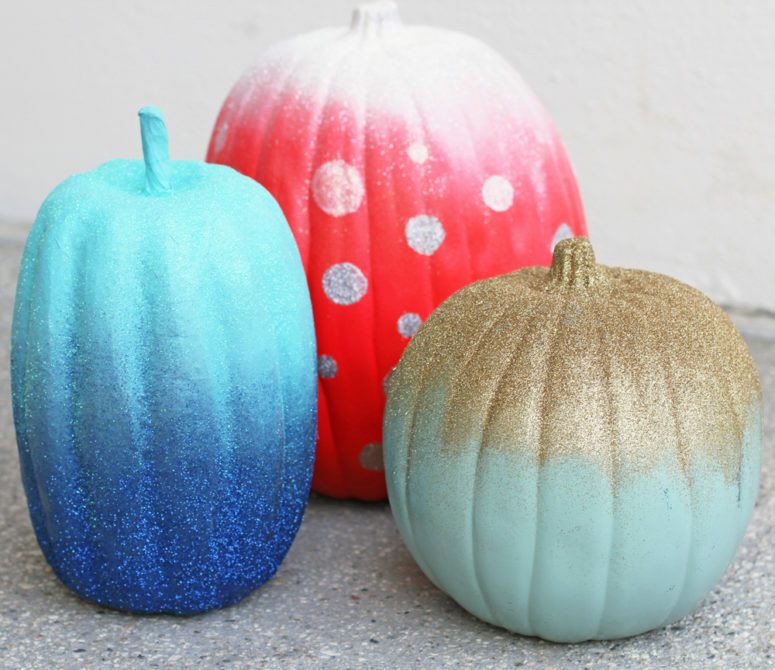 Read the tutorial to make these cool ombre pumpkins and add more of an ombre effect with glitter. If you are doing a gradation of dark to light you want to spray the darker spray paint first followed by the lighter spray paint on top then follow with the darker glitter first, followed by the lighter glitter. 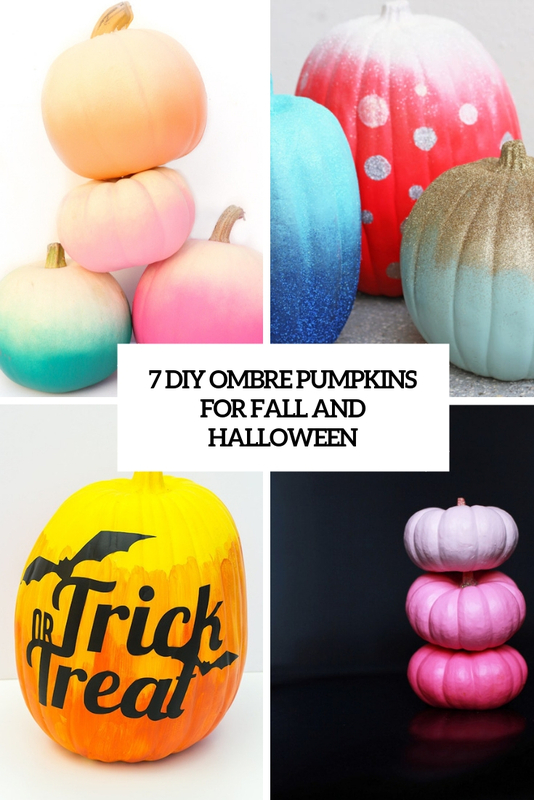 The post 7 DIY Ombre Pumpkins For Fall And Halloween appeared first on Shelterness.